Although there’s lots of amazing presentations at linux.conf.au, it’s also the people and passion involved that makes it such an amazing event. One of the great conversations I had at linux.conf.au 2012 was with Paul Fenwick, around human interactions. We all have different communication styles and preferences, and it was thought-provoking and mind-nourishing to chat with someone who was both familiar with the area, and who had novel ideas. Paul also introduced me to Anki, a free and open source flashcard tool designed to help you study things like characters, vocabulary, music and so on – basically any field of knowledge that requires commitment to memory. Even better, Anki has a number of pre-prepared decks available for download – including things like the NATO phonetic alphabet and SAT vocabulary tests. I was also privileged to spend a small amount of time – much less than I would have liked to – with Jason White. Jason has recently completed a PhD thesis in philosophy, around semantic theory, and it was fascinating to hear the details of his thesis topic. Jason is also an accessibility advocate for WCAG, and his Lightning Talk highlighted the Gnome Accessibility project. The Speakers’ Dinner was a particular highlight, and I was afforded the opportunity to meet Karen Sandler, Executive Director of the Gnome project and previous counsel at the Software Freedom Law Centre. 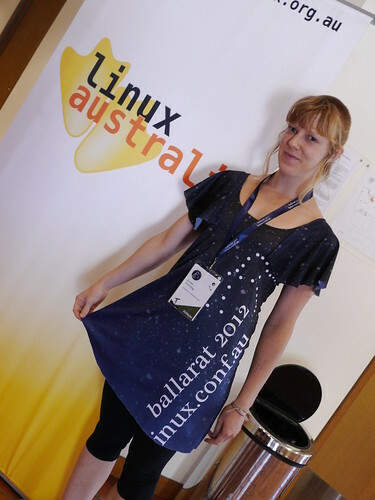 Karen’s keynote at linux.conf.au – ‘Free software in my heart‘ – was a compelling and engaging story about the ubiquity of technology, and how important it is to have control of the software which (literally) supports our lives. Again, I regret not having more time available to listen more to Karen’s journey. An incredible, inspiring, down to earth and approachable lady. It was also inspiring to meet the wonderful Selena Deckelmann, whose presentation on ‘Mistakes were made‘ was an eye-opener into change management and planning. One of the highlights for me personally was also the amazing dress created by Jenna Downing – wonderful stuff! Leslie Hawthorn gave a well delivered talk on “Mentoring – we’re doing it wrong“, and provided helpful tips for where best to spend your time when working or volunteering in a mentoring role. Sage advice for would-be mentors and mentees alike. Dario Freddi gave an informative talk on “Social Applications over XMPP“. This underscored that XMPP / messaging is the killer app of the future. Email is definitely in decline – and messaging will take up the slack here. In the Speakers’ room, Dario showed me an implementation of a boardgame – over XMPP! Definitely a technology to watch out for, particularly with the Unified Communications implications it has. Henare Degan presented on “Guerilla Data Liberation“, showcasing the ScraperWiki tool. Henare is one of the key developers behind Planning Alerts, and it was great to hear how councils, instead of claiming copyright, are engaging with Open Australia to make more data publicly and openly available. Allison Randall gave what I thought was an informative talk on “Desktop home hacks”, using Arduino and other componentry for home automation. What struck me with her perspective what the thought that had gone into making the technology “gentle” – such as a plastic egg which has multicolour LEDs for different alert types, allowing the user to be interrupted in a gentle, graduated way. She also showed how products like Supa Sculptey and InstaMorph for embedding LEDs in objects. Of course, the event wouldn’t happen without some amazing folk volunteering their time and energy. Conference Director Josh Stewart had a relaxed leadership style, and helped keep our spirits up through what was a tiring, gruelling, exhausting, but ultimately incredibly rewarding week. Sae Ra Germaine is just amazing to work with. She’s an incredible people person, and looked after all our mental health, and helped smooth out the inevitable team conflicts. Cameron Tudball was super organised, a perfect choice for our Treasurer. Thorne Lawler was brilliant, and helped to train and co-ordinate our volunteer team and their tasks – a superhuman effort. Erin Hatherell served as our Team Doctor, keeping us all sane with her great humour, and flair for finding lovely gifts (the “I’m so offended” t-shirts were epic). Our AV setup was simply outstanding, with thanks to the efforts of Tristan McArdle, and the network was the hard work of LT and his offsider Steve “Evil” Walsh. Our sysadmin, Duncan McNeill, did a brilliant job of administering our troublesome conferencing system, ZooKeepr.